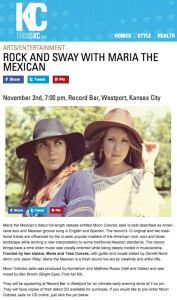 Maria the Mexican’s debut full length release entitled Moon Colored Jade is best described as Americana soul and Mexican groove sung in English and Spanish. The record’s 10 original and two traditional tracks are influenced by the classic popular masters of the American rock, soul and blues landscape while lending a new interpretation to some traditional Mexican standards. The record brings back a time when music was vocally-oriented while being deeply rooted in musicianship. Fronted by two sisters, Maria and Tess Cuevas, with guitars and vocals added by Garret Nordstrom and Jason Riley, Maria the Mexican is a fresh sound fueled by creativity and artful rifts. Moon Colored Jade was produced by Nordstrom and Matthew Russo (Hall and Oates) and was mixed by Ben Brodin (Bright Eyes, First Aid Kit).